Light Emitting Diodes (LEDs) offer long life, low cost, efficiency, brightness, and a full range of colors. Because of these properties, they are widely used for simple displays in electronic devices. A previously characterized, but little known property of LEDs allows them to be used as photo sensors. 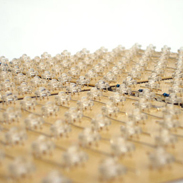 Fischtisch has a LED matrix under the surface used for output and input at the same time. The basic concept is that standart LEDs are both, light emitter and photo sensor. A LED is a diode which only lights up if it is biased in the right direction. On the otherside if we reverse bias the LED it charges its capacity. After that, we can measure the time until the LED is discharged. The leakage depends on the light intensity. 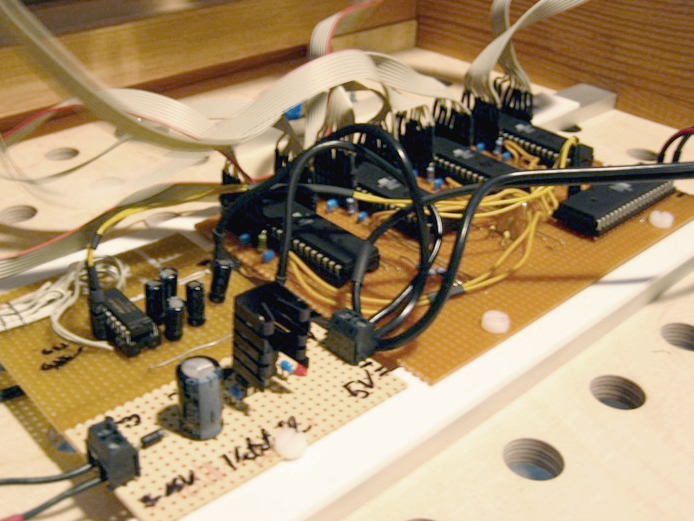 Here You can see a LED (underneath a piece of CORIAN�) connected to an Arduino-Bord. A program running on that board is triggering a LED as a light sensor as well as a light emitter. When the light intensity decrease, the LED will respond with an lower blinking frequency. 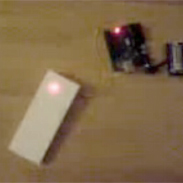 This small video (captured by a cell-phone) was the first setup for testing purposes. The matrix under the surface of the table consists of four submatrices. Each of them is controlled by a seperate microporcessor. 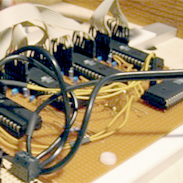 Each of the micro- processors maintains a buffer where the current part of the picture of the respective matrix is saved. 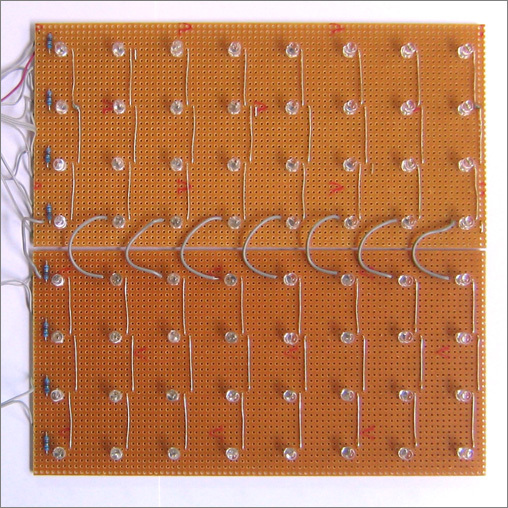 The picture of such a sub-matrix is rebuild 40 times a second whereby each pixel (LED) is switched on for 0.4 ms. Therefore, it takes 25 ms per frame. After each frame we reverse bias one LED. After that we measure the amount of voltage. Due to the leakage this amount depends on the light at the surface. consists of two wires, a data wire and a clock wire, respectively. In fact I2C is the standard for connecting IC’s.